Introducing LumiQuest's newest product, the Soft Screen. 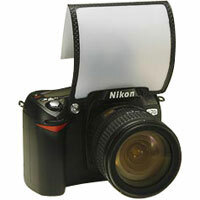 This diffuser is designed for the built-in pop-up flash of many Digital & 35mm SLR cameras. Dimensions: Folds flat to approximately 4"x4"
Please Note: Several recent Digital SLR camera models have smaller name plates than their predecessors. As a result, the LumiQuest Soft Screen might not be as secure when attached to these cameras. If you find this is the case and is problematic we have 1" x 1/8" Velcro fasteners to solve the problem. Please email Lumiquest Inc with an address and they will provide the Velcro at no charge. Folds flat and comes with a convenient storage ???envelope?? ?